Disable/Enable Windows Defender in Windows 8 – will show you how can you stop the Built-in-antivirus (Windows Defender) in Windows 8 and again Start the Windows defender at the time of requirement. You need to stop the Windows defender to use any antivirus software instead of Windows defender in Windows 8. 1. Open “Windows Defender” in Windows 8. (press Windows Key + Q to open the Apps search screen and type Windows defender. Click on Windows defender on the search result to open “Windows defender”). 2. Navigate to “Settings” tab. 3. Click on “Administrator” on the left side bar. 4. You will get a check box “Turn on Windows Defender” at the right side pane. 5. Just unchecked the option to stop Windows defender in Windows 8. 6. Click on “Save Setting”. 7. User Account Control (UAC) prompt will ask for your confirmation about turning off the Windows defender. 8. Just click on “yes“. 9. Windows defender will show you the confirmation message as “Windows Defender: Windows Defender has been turned off and is not monitoring your computer. If you are using any other app to check for malicious or unwanted software then use Action Center to check that app’s status“. 10. Click on “Close“. That is it. Now your Windows defender is turned off. When you find that your Windows defender is turned off, Then Action Center will show you a message at the right side of Windows task bar. If the message is not coming there, then you need to turn on the message for “Spyware and unwanted software protection” and “Virus protection”for Action Center. Follow the steps to turn on the Windows defender. 1. When you turn on the message for “Spyware and unwanted software protection” and “Virus protection” of Action Center. You will get a red cross symbol with the Action Center icon at the right side of task bar. Just Click on there. 2. Now click on “Turn on Virus protection (important)” or “Turn on spyware protection (important)“. 3. Wait for some time. 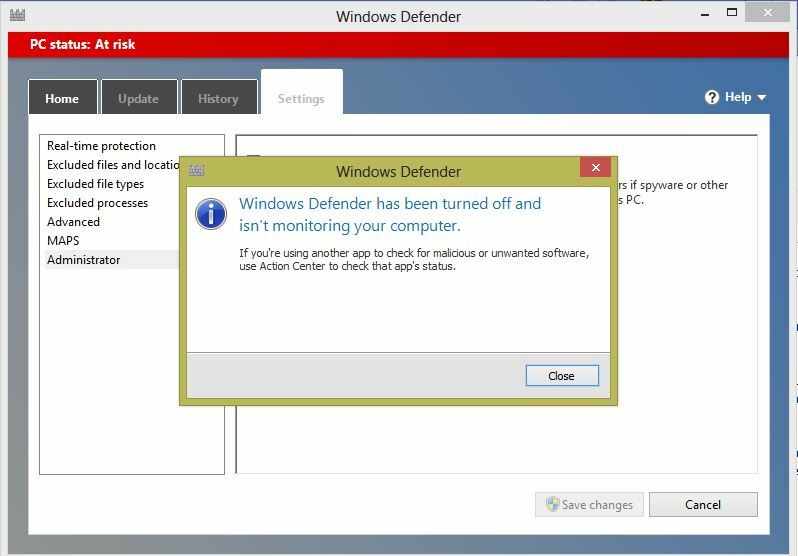 Windows defender in Windows 8 will turn on after some time. 4. That is it. Now your PC/System is protected by Windows defender. Also Check: List of some latest Working keyboard shortcuts for Yahoo Mail! The screenshot will appear when you want to deactivate it. At the time of activate windows defender it will not show that box. All that pops up is a message that says: “Windows defender has been turned off and isn’t monitoring your computer. If you’re using another app to check for malicious or unwanted software, use Action Center to check that apps statues” It doesn’t go to the Windows Defender homepage like it should. if u were using Avast antivirus in windows 8 and uninstalled that then u will not be able to turn Windows defender on. then run this program in safe mode after that restart your pc again and you will be able to turn on Windows defender in Windows 8.
i cannot able to turn on windows defender. if i click the turn on virus production in action center it goes to C:\Windows\System32 . what can i do ? i was using asc ultimate but after unstalling it i am not able to turn on window defender. NO, I get the same above. It has been turned off and isnt monitoring your computer. It will not let me turn it on. If I search through and get to services and try to start it there, it wont let me. I guess something is out of date so It wont let me turn it on. I need help. same thing as Marie. My windows defender has been turned off and isnt monitoring my computer. I cannot turn it on. It will not give me any options of anything. If I go through to services, I can find it and hit start but it gives me an error message.